A belated Happy New Year, everyone. Like most the UK, we’ve had our fair share of #uksnow, and I’ve used the time wisely, holed up in my shed finishing up the camera ready copy for the DHQ volume on cyberinfrastructure and classics, in memoriam to Ross Scaife, which is going to be printed up by Gorgias Press. But thats not what I want to talk about here. 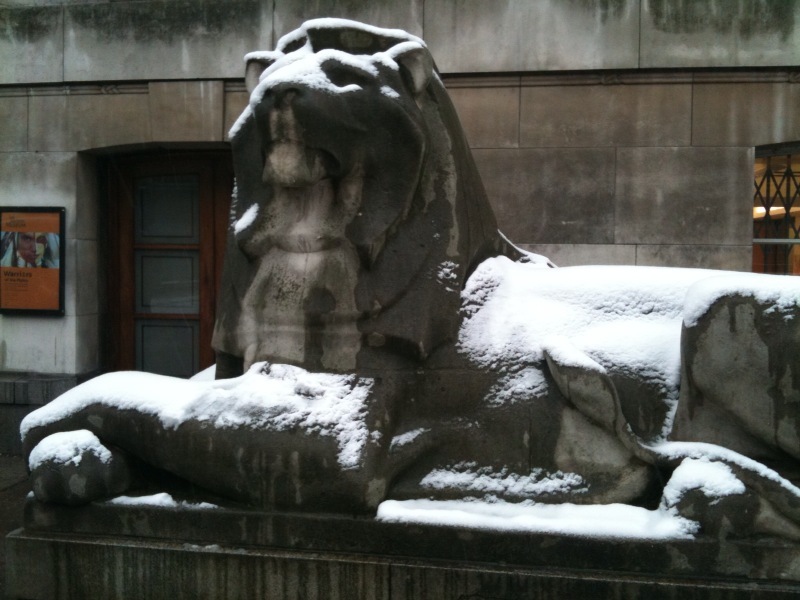 I made it into London yesterday in the constant snow: here is one of the Lions in front of the British Museum, looking a bit chilly. I had a meeting there as part of the Linksphere project, we hope to do some collaborative research with them on various things (early days, few details to share at yet, but exciting possibilities and a great meeting). The interesting thing I want to highlight was how this came about. We are only 10 mins walk up the road from the BM, but its often hard to meet likeminded people in other organisations. So how did we get together? Because someone important at the BM saw some of @Clairey_ross‘s twitter posts, about the research we are doing. And lo, social media does lead to some new research possibilities. Other things that are happening. I’m writing a book chapter about truth and representation in digital images, and particularly digitised images of text, and the implications that this has for manuscript based scholarship. How did this come about? A silly game on Facebook, which looks for the longest word you can make from letters in your name. Mine is materialisms, apparently. And a friend joked that that was ironic, given that my research primarily exists in the digital, rather than material world. To which I said that I was editing a book on Digitizing Material Culture – and forementioned friend, who is an expert in classical art, particularly theories of representation, said “have you ever thought of applying *that* to *this*? Which of course I hadnt. And now I shall. See, Facebook was useful for my work, after all. Its these connections, and happenstances, which are perhaps the most useful? amusing? thing for me about social media. Sure, there is all the web 2.0 stuff – such as DHNow, – but I’m enjoying the unexpected. In the olden days (ie ten years ago), I used to enjoy looking at the books next to the books I needed in the Library. They invariably had the thing I was really looking for, or sent you off on another, random, unexpected trail. I’m glad that social media, for me, is starting to allow the same things to happen. If you are not doing anything next week, and happen to be around Oxford, I’m helping chair an eScience Institute workshop on users, research, and web 2.0. Plenty of interesting speakers about interesting research in the area. There are still spaces, and its free: do come along.